So many problems can be solved with a few deep breaths. Really. 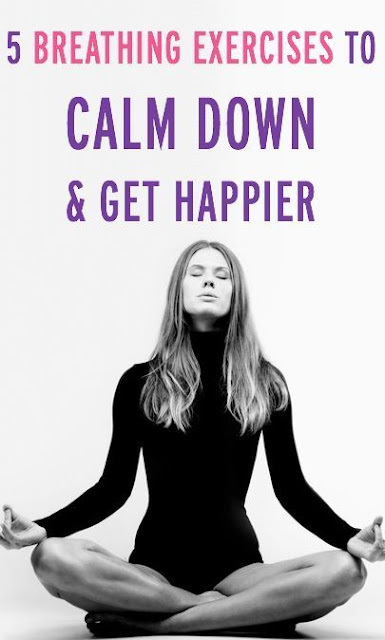 Doing controlled breathing exercises is a quick, convenient and effective (not to mention free) way to reduce feelings of stress and tension, boost confidence, ease muscle tension and pain, improve concentration, lower blood pressure and promote a general feeling of calm. And different types of breathing exercises can promote different types of wellbeing. So the next time you find yourself in each of these types of situations below, allow yourself to slow down for a moment to practice a mindful breathing exercise. Next time you feel yourself slipping into a gloomy, blue mood or starting to feel pangs of anxiety, step back and take a moment to center your breathing. “A few moments focusing on your breath in a meditation can do wonders to quiet the negative thoughts and get you centered into a calmer, more balanced state,” explains certified wellness coach for women in recovery Elizabeth McGann. 1. Sitting up straight in a chair or sitting on the floor, close your eyes and put one hand in the center of your chest and one hand over your belly button. 2. Take a deep breath in through your nose for eight counts, feeling your belly expand with the breath. 3. Hold your breath for a count of eight. 4. Exhale your breath slowly through your nose for the count of 10.